UN’s Ban to Address Myanmar Parliament With Suu Kyi’s Seat Empty | Life is short,have fun!!! (Bloomberg) When United Nations Secretary- General Ban Ki-moon becomes the first world leader to address Myanmar’s year-old parliament today there will be a notable absentee: Aung San Suu Kyi. The refusal of Myanmar’s most famous dissident to take an oath to “safeguard” the constitution after winning a seat in by-elections this month puts Ban in the middle of an impasse between her and President Thein Sein, the retired general behind the country’s awakening from five decades of isolation. Suu Kyi wants the oath changed to say lawmakers will “respect” the constitution, which guarantees the military 25 percent of seats, according to her party’s spokesman, according to Bloomberg report. The vacant seat threatens to slow the pace of political and economic changes that have prompted the U.S. and European Union to ease sanctions against a country of 64 million people where one in 30 has a mobile phone. Suu Kyi’s demand is a risky early test of her clout, according to Vikram Nehru, a former economist at the World Bank. On April 1, Suu Kyi’s National League for Democracy party won 43 of 45 seats in by-elections, the most inclusive vote in two decades. That outcome convinced Western nations to loosen sanctions and development agencies to contemplate a resumption of financial aid. As Myanmar’s biggest creditor, Japan forgave about $3.7 billion of debt in a bid to infiltrate a market dominated by rival China, its biggest trading partner. Ban, making his first trip to Myanmar since July 2009, will address the 664-member lawmaking body that is controlled by Thein Sein’s Union Solidarity and Development Party and the military. Suu Kyi’s party “welcomes” the address even though it likely won’t attend, spokesman Nyan Win said. “I don’t know exactly if we will participate in Parliament,” he said by phone from Yangon yesterday. The standoff may end “in one or two weeks,” he said. Three years ago, Ban said he was deeply disappointed to have been barred from seeing Suu Kyi, known in her homeland simply as “The Lady.” Her father, General Aung San, was an independence hero and was assassinated when she was 2 years old. Tomorrow, as he wraps up a three-day trip, Ban will meet the Nobel Peace Prize winner for the first time by Yangon’s Inya Lake at her family home, where she spent 15 years of the past 23 years under house arrest. “The pace as well as the nature of the change has been in some ways extraordinary, and perhaps far in advance of what had been envisaged,” Vijay Nambiar, who is traveling with Ban as the UN’s special adviser on Myanmar, told reporters last week. In Naypyidaw, unveiled in 2005 as the new seat of government to replace Yangon located 200 miles (322 kilometers) to the southeast, Ban will meet the retired generals who now form the face of an elected leadership looking ahead to the next nationwide vote expected in 2015. Since taking office in March 2011, Thein Sein has freed political prisoners, held talks with Suu Kyi, dismantled a fixed exchange rate that distorted government revenue and halted the construction of a $3.6 billion Chinese-backed hydropower project in response to growing criticism China was exploiting Burmese resources. He has also sought peace deals with ethnic-based armies that control certain border areas. Apart from Thein Sein, 67, Ban will hold talks with Lower House Speaker Shwe Mann, 64, ranked No. 3 in the junta that ruled Myanmar until last year, and the railways minister, Aung Min, 62, who has been negotiating peace agreements with ethnic rebel armies. While in the capital, UN officials will also offer advice on methodology for Myanmar’s first census in 30 years. Population estimates vary widely, with the World Bank putting the figure at 48 million, the Asian Development Bank at 60 million and the IMF at 64 million. The Washington-based World Bank will open an office in Myanmar in June to help assess the country’s debt levels. The ADB is preparing to offer Myanmar several hundred million dollars per year in grants and loans if the government clears overdue debts and Western nations give approval. 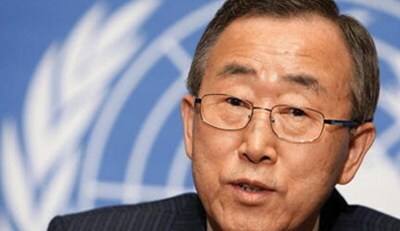 Ban will seek clarification during his trip on the government’s priorities. About 75 percent of the country lacks access to electricity and more government funds are needed to improve roads, bridges, hospitals and schools, the ADB said this month. Ban will travel in a helicopter to Shan State, a mountainous and isolated region where opium production is rampant as farmers cultivate poppy fields as a cash crop to buy food and other basic goods. Myanmar is the second-biggest producer of opium after Afghanistan and has a rising number of drug users that have led to the third-largest HIV epidemic in Asia, according to the UN’s program on HIV/AIDS. The UN Office on Drugs and Crime last month expressed “cautious optimism” that government efforts to eradicate opium in the region have made significant progress, in part due to negotiations on peace deals with minority ethnic groups.